Cheerleading is no longer “eye-candy” for spectators and simply a group of girls and young woman screaming and jumping along the sidelines of a football match. It’s a fantastic sport that has come into its own with cheer competitions and specialized training for cheerleading. This expansion has led to competition cheer squads which go head-to-head for cheer and gyms that are in the businesses of teaching and building cheerleading squads for both competition and games. A must for all cheer gyms, general liability insurance protects you if you are sued by someone who claims that you caused their physical injury or damaged their property. *Per occurrence is the maximum amount paid on a covered individual claim; aggregate is the maximum amount paid on all covered claims combined, within the policy period. 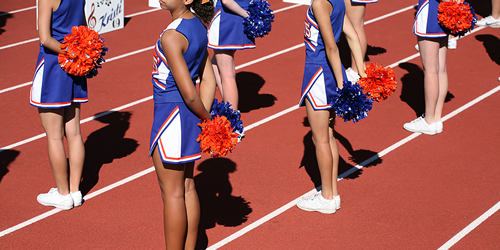 Accident medical insurance will pay cheerleaders’ medical bills if they’re injured at your health club or during actions you sponsor and have no insurance of their own, or their bills exceed what their insurance pays. It’s possible by paying a cheerleader’s health bills at this time, you might be able to avoid a lawsuit. Accident insurance is marketed as a minimum earned premium policy, therefore you may not receive any return premium.